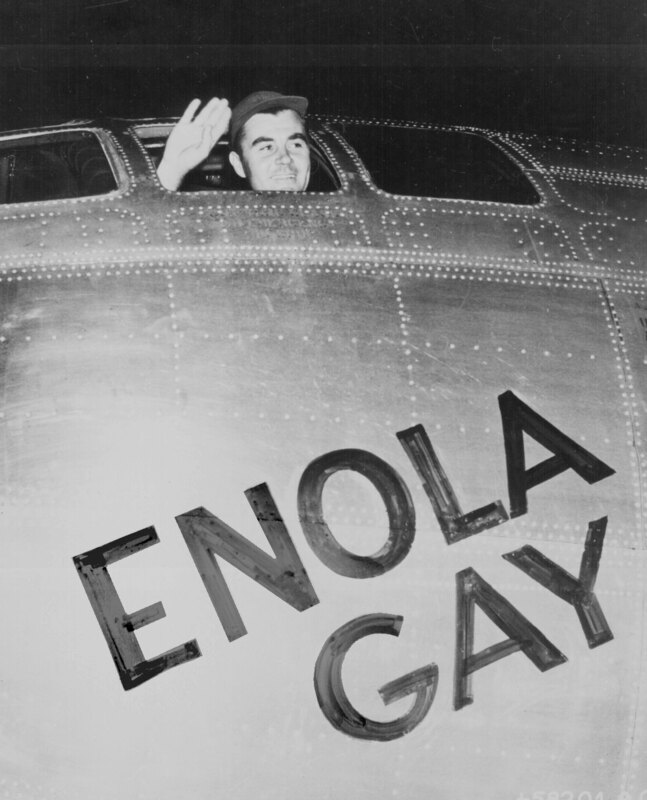 The Enola Gay was a bomber, named for Enola Gay Tibbets, the mother of the pilot, Colonel Paul Tibbets, who selected the aircraft while it was still on the assembly line. On 6 August 1945, during the final stages of World War II, it became the first aircraft to drop an atomic bomb. Unlike the bombs with which the US Air Force had scorched Japan for roughly a year, this bomb was not filled with the usual incendiaries. Rather than isobutyl methacrylate or its more famous kin, napalm, this bomb was packed with two masses of highly enriched uranium-235. The bomb, named “Little Boy”, was anything but: snout-nosed and weighing in at 9,700 pounds (4,400 kg), it resembled nothing more than an obese metal baseball bat. At 8:15 a.m. local time, poised above Hiroshima’s Aioi Bridge, Little Boy dropped. 44.4 seconds later it detonated. 60,000 people died instantly. 31,000 feet above (9,500 meters), and 10 and a half miles away from them, Paul W. Tibbets, en route to Guam, felt a 2.5g shockwave driven before a kaleidoscopic pillar of smoke and debris. He felt no regrets. In a 1975 interview Paul Tibbets said: “I’m proud that I was able to start with nothing, plan it and have it work as perfectly as it did. I sleep clearly every night”. “I knew when I got the assignment”, he told a reporter in 2005, “it was going to be an emotional thing. We had feelings, but we had to put them in the background. We knew it was going to kill people right and left. But my one driving interest was to do the best job I could so that we could end the killing as quickly as possible”. One frightening aspect of nukes today is that they’re many times more powerful than the Little Boy bomb: “The atomic bombs dropped on Hiroshima and Nagasaki were comparable to explosions of about 15 to 20 kilotons of TNT. It is estimated that these two bombs killed roughly 200,000 people in the near term, with more dying in the following years from cancer. In comparison, today’s thermonuclear weapons are much more powerful. An average U.S. weapon would explode with a yield of 300 kilotons of TNT”. It's interesting for me that no one leaves a comment on this horrific massacre, while everyone tries to stick the blame on Nazi Germany for what not completely proved to be true (but most of it advertisement). what's your idea? Not sure what point you are trying to make... That the Japanese didn't have some culpability in the whole mess? That the atrocities committed by the Reich are fabricated? Just accept that while the bomb was an apocalyptic terror it did get them to stop. Until Nagasaki they had given plenty of reason for the Allies to believe they would fight to the last civilian who could swing a club.